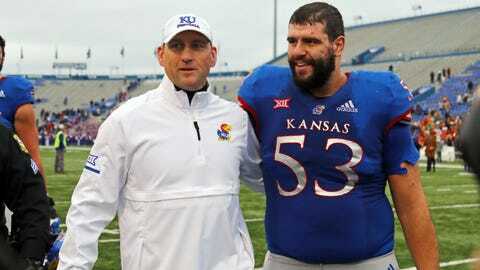 David Beaty (pictured with offensive lineman Alex Fontana) coached his final game at Kansas on Friday, a 24-17 loss to Texas. LAWRENCE, Kan. — Sam Ehlinger and No. 11 Texas made enough plays to put away Kansas. Next up is a much bigger challenge. Ehlinger threw for two touchdowns and ran for a score, and the Longhorns beat the Jayhawks 24-17 on Friday to clinch a spot in the Big 12 title game. Texas (9-3, 7-2, No. 15 CFP) opened a 24-7 lead on Cameron Dicker‘s 34-yard field goal in the fourth quarter, but Kansas responded with Peyton Bender‘s 31-yard touchdown pass to Daylon Charlot and recovered the ensuing onside kick. After Gabriel Rui made it a one-score game with a 45-yard field goal with 1:37 remaining, the Jayhawks (3-9, 1-8) were unable to recover another onside kick and the Longhorns closed it out from there. Tre Watson finished with 79 yards on 14 carries as Texas earned its third consecutive victory. The Longhorns will face No. 6 Oklahoma in the Big 12 championship next Saturday. “We put a little cushion out for us there towards the end, but we knew they weren’t going away,” Herman said. Kansas dropped its last four games in David Beaty’s final season as Jayhawks coach. Les Miles takes over the downtrodden program after he was hired on Sunday. Beaty leaves Kansas with a 6-42 record. But the final of his four seasons in charge included three wins, a conference victory over TCU and the end of the Jayhawks’ 46-game road losing streak. Ehlinger threw two interceptions, one in the second quarter to Najee Stevens-McKenzie and one late to Shak Taylor. He had gone 10 straight games without an interception after throwing two in the season opener against Maryland. Ehlinger played through a shoulder injury he aggravated last week after originally coming down with the issue back in October. But he downplayed the significance. “It wasn’t something that was limiting at all,” he said. The Longhorns had a 98-yard drive on their first possession that ended with a 26-yard touchdown pass from Ehlinger to Collin Johnson. Texas’ offense struggled for much of the first half, and then got back on track in the third quarter. Watson’s 31-yard run helped set up Andrew Beck‘s 5-yard touchdown reception, and Ehlinger’s 3-yard TD run made it 21-0 with 1:02 left. Pooka Williams Jr. had 18 carries for 103 yards for Kansas, including a 57-yard touchdown run in the fourth. Bender was 18 for 35 for 159 yards. Texas safety and punt returner Brandon Jones left with a head injury after taking a helmet-to-helmet hit from Emmanuel Moore while fielding a punt in the second quarter. “We’ll take 24 hours to diagnose it as a concussion, and get him in that protocol if it is truly that,” Herman said. Texas: It was a sweet day for the Longhorns after its 2016 loss at Memorial Stadium ended a string of 13 consecutive wins over the Jayhawks, likely sealed the fate of embattled coach Charlie Strong and ultimately led to Herman’s hiring away from Houston. Kansas: Fails to send Beaty off with a win, capping another losing season. Texas: Beat Oklahoma 48-45 on Oct. 6. Kansas: The Miles era begins in earnest.